AAEA Hollywood: Will Rupert Murdoch Improve DC Newspaper Market? The Washington Post ran a tongue-in-cheek piece on the possibility of Rupert Murdoch, right, expanding the distribution of the New York Post in the Washington Metropolitan Area. Evidently Murdoch is printing copies of the NYP at local printing presses owned by the Baltimore Sun. Interesting. We hope Mr. Murdoch will publish a local paper in Washington, DC. Although The Washington Times does an excellent job, New York City has three major dailies. DC deserves no less. Maybe the District of Columbia Post. The Washington Post is arrogant because of its monopoly status in the nation's capital. Their liberal bias is sickening. Their Democratic Party bias is unprofessional. 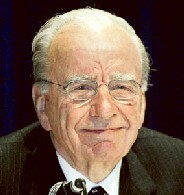 Murdoch's News Corp Inc is desperately needed in Washington, DC. We need fair and balanced reporting from more print media sources.